5 Operating Data Pressure and Speed Limits asic model Geometric Maximum shaft Maximum outlet designation dispalcement, speed (r/min) pressure, bar (psi) cm 3 /r (in 3 /r) nti-wear Water-in Water- nti wear Water Water-in hydraulic oil glycol hydraulic glycol oil oil emulsion oil emulsion (%/6%) (%/6%) PF, (.6) 36 (3) PF, (.9) (3) 7 () 7 () PF,8 (.6) 7() PV, (.6) (3) () () PV6 3,8 (.8) () () () PV, (.9) (3) () () PV 33, (.) () () () PV,8 (.6) (3) () () PV9 6,6 (3.76) () () () PV 9, (.76) (3) () () PV9 97, (.) 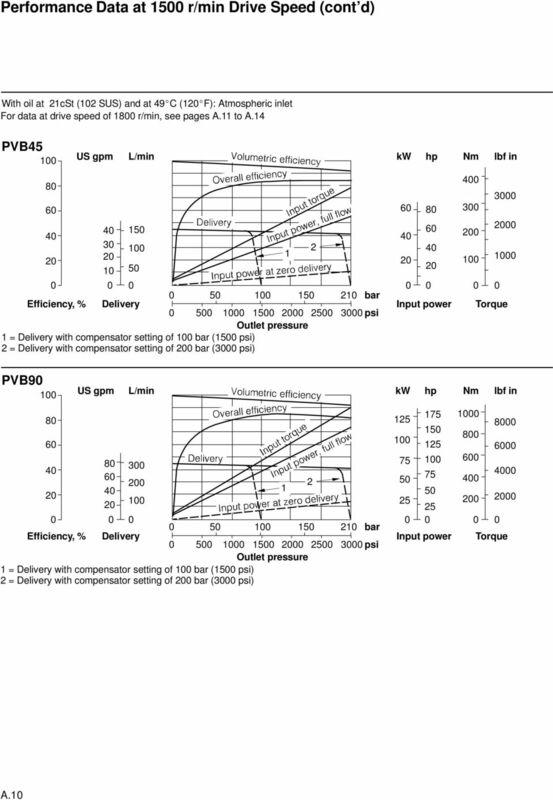 8 (3) () () Maximum Inlet Pressure ll pumps except PV/6// with H, M or V controls , bar ( psi) PV/6// with H, M or V controls s Max. outlet pressure above for appropriate size. 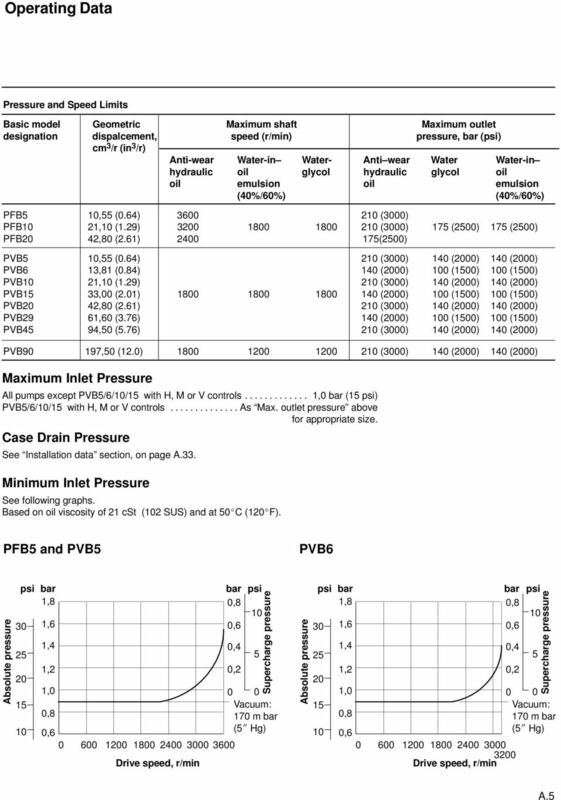 Case Drain Pressure See Installation data section, on page.33. Minimum Inlet Pressure See following graphs. ased on oil viscosity of cst ( SUS) and at C ( F). 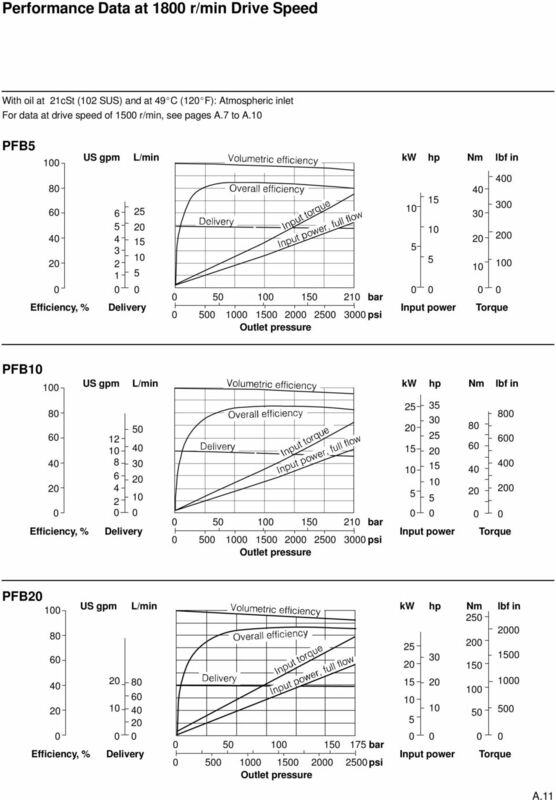 PF and PV PV6 bsolute pressure psi 3 bar,8,6,,,,8,6 6 bar,8,6,, Drive speed, r/min psi Supercharge pressure Vacuum: 7 m bar ( Hg) bsolute pressure psi 3 bar,8,6,,,,8,6 6 8 Drive speed, r/min bar,8,6,, 3 3 psi Supercharge pressure Vacuum: 7 m bar ( Hg). 10 Performance Data at r/min Drive Speed (cont d) With oil at cst ( SUS) and at 9 C ( F): tmospheric inlet For data at drive speed of 8 r/min, see pages. to. PV 8 6 US gpm L/min kw hp 3 bar 3 psi Input power Torque = with compensator setting of bar ( psi) = with compensator setting of bar (3 psi) Nm 3 lbf in 3 PV9 US gpm L/min kw hp bar Input power Torque 3 psi = with compensator setting of bar ( psi) = with compensator setting of bar (3 psi) Nm lbf in. 11 Performance Data at 8 r/min Drive Speed With oil at cst ( SUS) and at 9 C ( F): tmospheric inlet For data at drive speed of r/min, see pages.7 to. 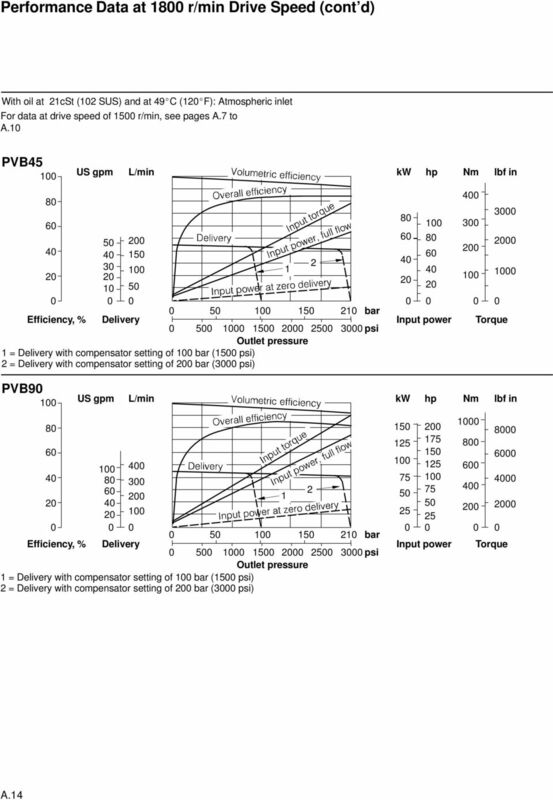 PF 8 6 US gpm 6 3 L/min kw hp Nm lbf in bar 3 psi Input power 3 3 Torque PF 8 6 US gpm L/min kw hp bar 3 psi 3 3 Input power Nm lbf in Torque PF 8 6 US gpm L/min kw hp bar psi 3 Input power Nm lbf in Torque. 14 Performance Data at 8 r/min Drive Speed (cont d) With oil at cst ( SUS) and at 9 C ( F): tmospheric inlet For data at drive speed of r/min, see pages.7 to. 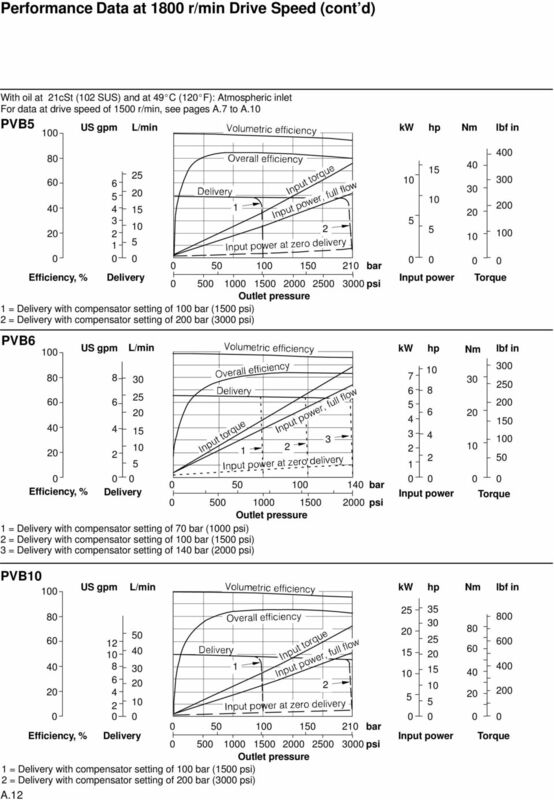 PV US gpm L/min kw hp bar 3 psi Input power Torque = with compensator setting of bar ( psi) = with compensator setting of bar (3 psi) PV9 8 6 US gpm L/min kw hp bar Input power Torque = with compensator setting of bar ( psi) = with compensator setting of bar (3 psi) 3 psi Nm Nm 8 6 lbf in lbf in 8 6. 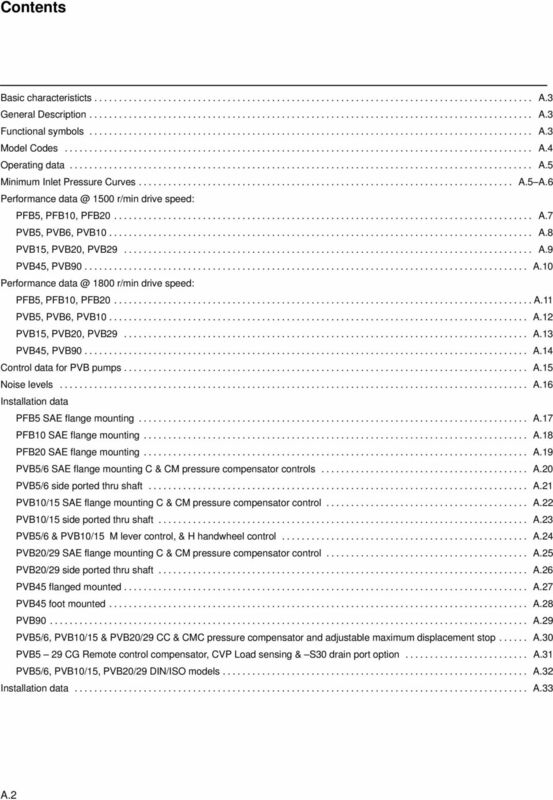 15 Control Data for PV Pumps Controls available as indicated in Model Code section. 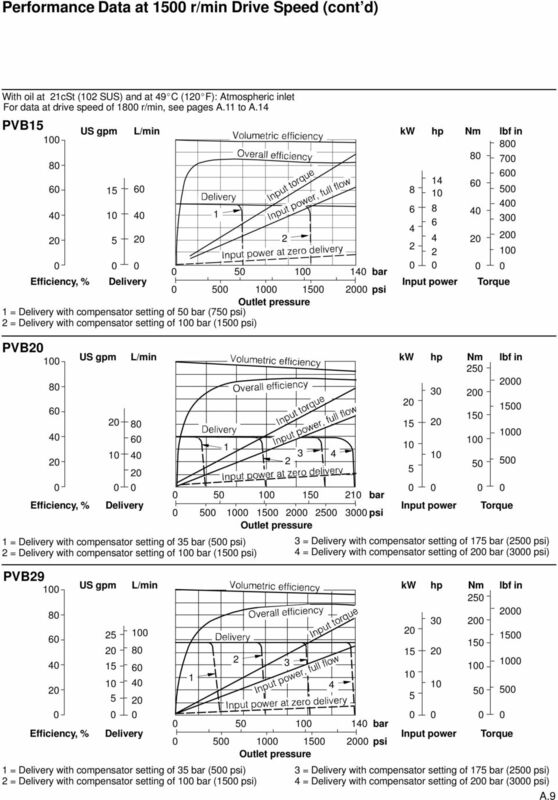 C and CM Pressure Compensators utomatically adjusts pump delivery at pre-adjusted pressure to match system demand. can decrease rapidly from maximum to zero through a pressure gradient typically to 6 bar (6 to 9 psi) with normal circuit volumes. 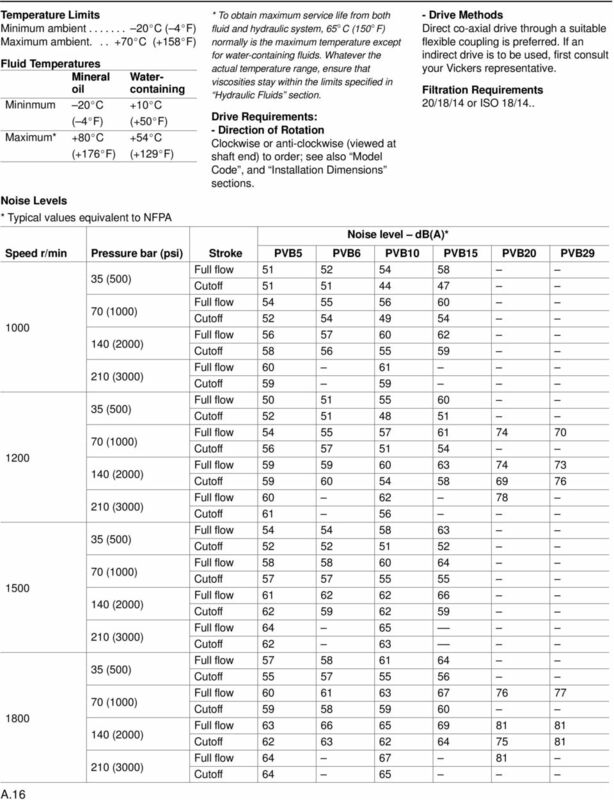 For pressure adjustment ranges see Model Code. Note:. When using PV6, or 9 pumps with C type compensators ther user must ensure that the maximum pressure setting never exceeds or bar ( or psi) dependent on the type of fluid being used. Caution. It is possible to mechanically adjust the compensator up to bar (3 psi).. It is recommended that, as for other types of positive pump, a relief valve should be fitted externally as protection against overloads. Where a relatively large amount of fluid is directly subject to compensator pressure, it may be possible to omit the relief valve. Consult your Vickers representative. CC and CMC Pressure Compensators with djustable Max. Displacement Stop The pressure compensator section performs as described above. The adjustable stop allows the maximum pump delivery to be adjusted between to %. To assist priming, adjust the stop setting to provide at least % of the maximum displacement. CG Pressure Compensator, Remotely Controlled Same as the C compensator, but arranged for remote pressure adjustment by suitable pilot controls. One or more pilot relief valves (e.g. C-7-*) and/or pilot directional valves, in series or in parallel, can provide many varied remote pilot systems. Your Vickers representative will be pleased to advise on optimum arrangements for individual applications. 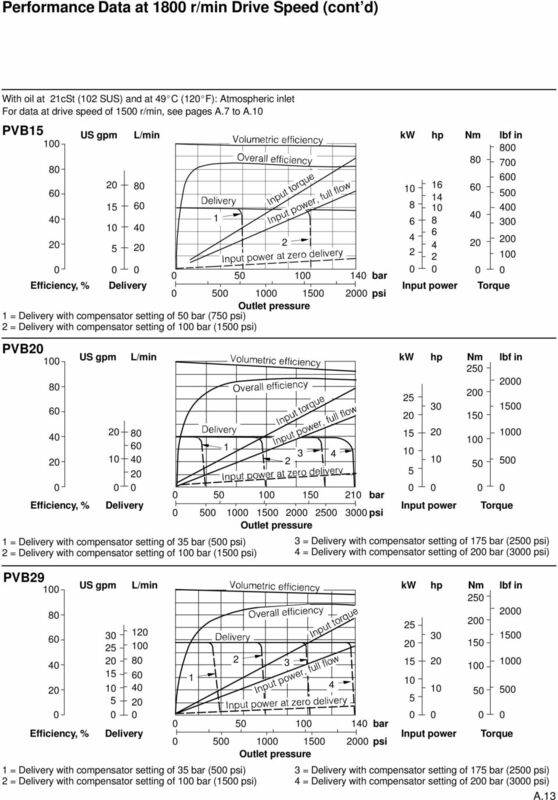 CV Load Sensing Comensator, Remotely Controlled utomatically matches pump delivery to system demand at a pressure approximately 7 bar ( psi) above load pressure. This pressure difference can be created by: a variable flow restrictor (noncompensated flow control) or the spool opening of a directional control valve. oth forms can be used with fixed and variable speed pump drives. In the latter case a fixed restrictor can provide preset, near-constant pump flow independent of drive speed, provided that the speed exceeds that which gives the required flow at full displacement. 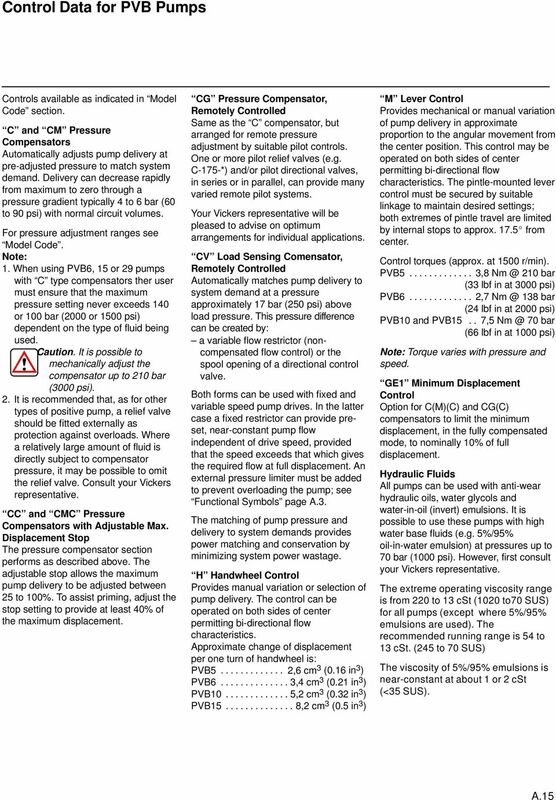 n external pressure limiter must be added to prevent overloading the pump; see Functional Symbols page.3. The matching of pump pressure and delivery to system demands provides power matching and conservation by minimizing system power wastage. 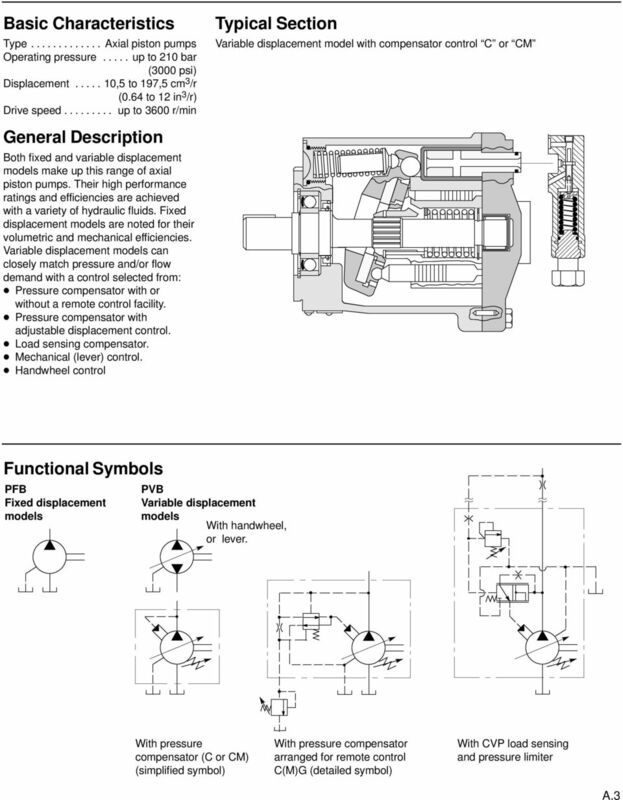 H Handwheel Control Provides manual variation or selection of pump delivery. The control can be operated on both sides of center permitting bi-directional flow characteristics. pproximate change of displacement per one turn of handwheel is: PV ,6 cm 3 (.6 in 3 ) PV , cm 3 (. in 3 ) PV , cm 3 (.3 in 3 ) PV , cm 3 (. in 3 ) M Lever Control Provides mechanical or manual variation of pump delivery in approximate proportion to the angular movement from the center position. This control may be operated on both sides of center permitting bi-directional flow characteristics. The pintle-mounted lever control must be secured by suitable linkage to maintain desired settings; both extremes of pintle travel are limited by internal stops to approx. 7. from center. Control torques (approx. at r/min). 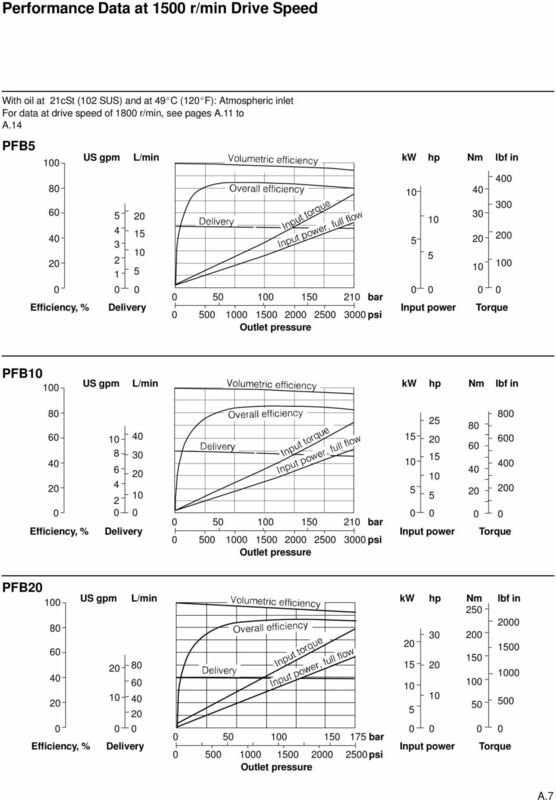 PV ,8 bar (33 lbf in at 3 psi) PV ,7 38 bar ( lbf in at psi) PV and PV.. 7, 7 bar (66 lbf in at psi) Note: Torque varies with pressure and speed. GE Minimum Displacement Control Option for C(M)(C) and CG(C) compensators to limit the minimum displacement, in the fully compensated mode, to nominally % of full displacement. Hydraulic Fluids ll pumps can be used with anti-wear hydraulic oils, water glycols and water-in-oil (invert) emulsions. It is possible to use these pumps with high water base fluids (e.g. %/9% oil-in-water emulsion) at pressures up to 7 bar ( psi). However, first consult your Vickers representative. The extreme operating viscosity range is from to 3 cst ( to7 SUS) for all pumps (except where %/9% emulsions are used). The recommended running range is to 3 cst. 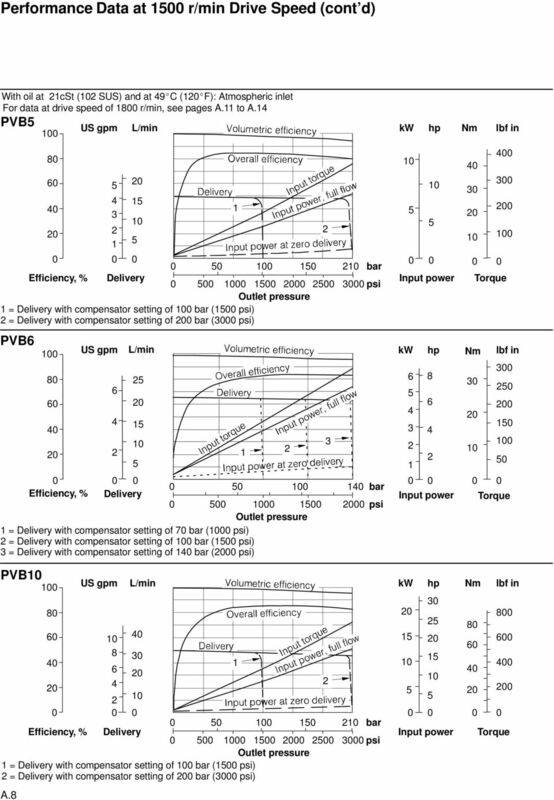 ( to 7 SUS) The viscosity of %/9% emulsions is near-constant at about or cst (<3 SUS)..
20 PV/6 SE Flange Mounting: Pressure Compensator Control - C and CM Installation Dimensions in mm (inches) See also Control Data section, page.. 3 (.3) Height of foot bracket Compensator position for: R.H. rotation models L.H. rotation models R.H. Shaft Rotation 6, (.9) Optional foot bracket, shown in dashed outline; kit F-- comprises foot bracket and two pump fixing bolts bolts. Order separately, if required. R,6 (.8 rad),7 (.) Case drain port 9 / 6-8 UNF- for SE O-ring fittings: ports, 77 (6.9) (.7) 6,8 (6.) 8,7 (.3) 69,8 (.7) 69,8 (.7) R7,8 (.9 rad) 33, (.3) holes 3 / 8 6 UNC- thread (foot bracket) 79, (3.) 7, (. ), (6.) 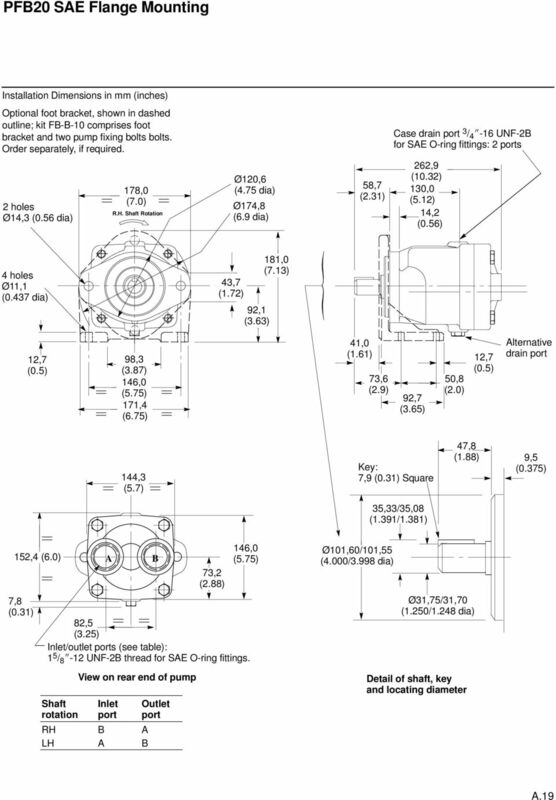 holes Ø, (.37 dia) (pump flange) Ø3 (. dia),7 (.) holes Ø, (.37 dia) 9, (.3) 93 (3.7),7 (. ),8 (.) 63, (6.) Caution: While pump is operating do not back compensator adjustment screw out beyond dimension shown. 8,8 (3.3) 8, (.) Key:,8 (.9) Square x, (.) long,3/, (.83/.87) 79, (3.) Ø8,/8, (3./3.8 dia) 38, (.) 7, (.) 3,9 (.3),3 (.6) lternate drain port Ø9,/9, (.7/.79 dia) 6, (.) Detail of shaft, key and locating diameter Inlet/outlet ports (see table): / 6 - UNF- thread for SE O-ring fittings. View on rear end of pump Shaft rotation Inlet port RH LH Outlet port. 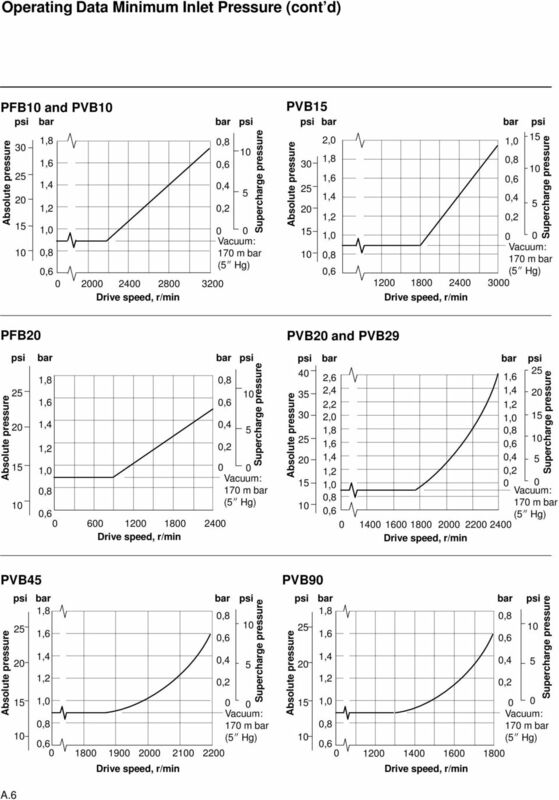 21 PV/6 Thru-Shaft Models (with Side Ports) Installation Dimensions in mm (inches) Maximum output torque is Nm (3 lbf in), less unput torque at system pressure, see performance curves: t r/min drive speed, page.8. 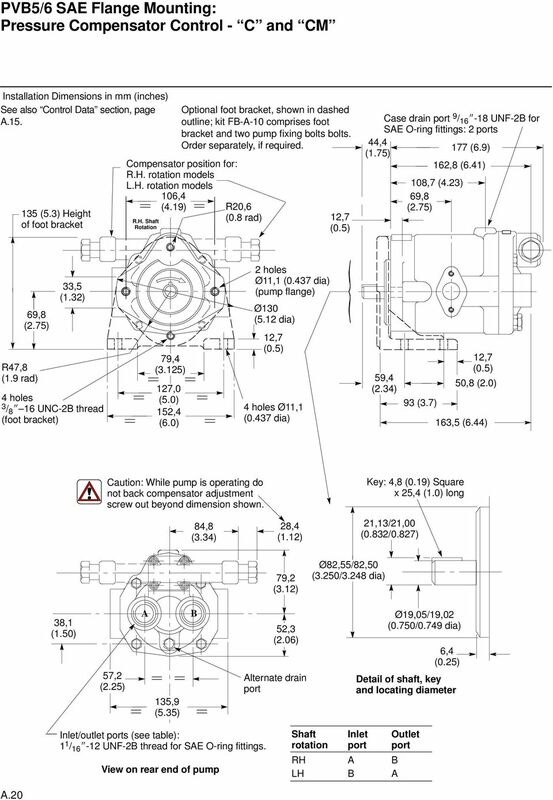 t 8 r/min drive speed, page.. For other dimensions and installation data see page.. 3, (6.3),77/,7 (.88/.87) square key both ends 7,9/7,78 (.7/.7) Outlet port for RH rotation models; Inlet port for LH rotation models: / 6 - UN- thread for SE O-ring fittings. 9, (.6) 77, (6.97) 3, (8.) Ø,8/,8 (.63/.6 dia) Inlet port for RH rotation models; Outlet port for LH rotation models: / 6 - UN- thread for SE O-ring fittings. 6, (6.) 73, (.88),3 (.). 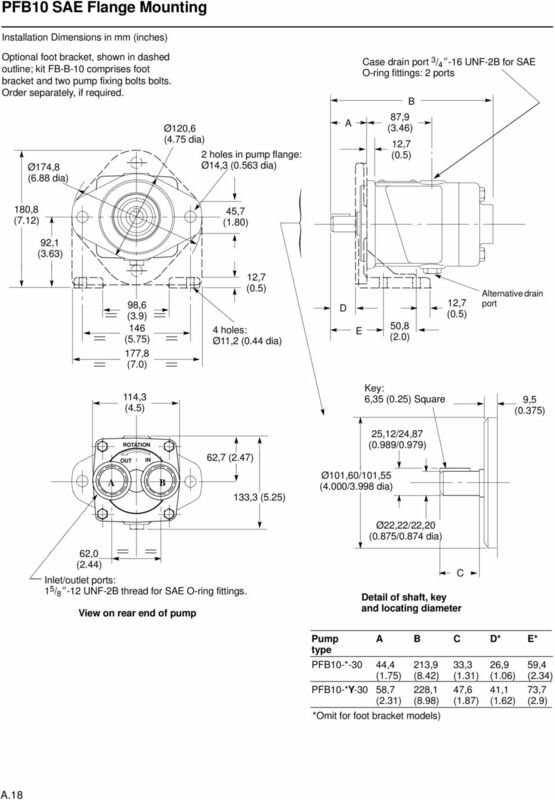 22 PV/ SE Flange Mounting Pressure Compensator Control - C and CM Installation Dimensions in mm (inches) See also Control Data section, page.. Compensator position for: R.H. rotation models L.H. rotation models Ø,6 (.7 dia) Optional foot bracket, shown in dashed outline; kit F-- comprises foot bracket and two pump fixing bolts bolts. Order separately, if required. 8,7 (.3) Ø7,8 (6.88 dia),7 (.) 7,7 (.9) Case drain port.7-6 UNF- for SE O-ring fittings: ports 3,7 (.87) 7,8 (8.8) 93,8 (7.63).-3 UNC - thd. holes holes Ø,3 (.63 dia) 98,6 (3.9) 8, (. ),3 (.) 6 (.7) 87 (7.36),7 (.8) Caution: While pump is operating do not back compensator adjustment screw out beyond dimension shown. R.H. Shaft Rotation 89,3 (3.) max 8,8 (3.3) 37, (.) max 3,9 (.9) 9, (3.63) 7,6 (6.9),7 (.) holes Ø, (. dia) 8, (.) 8, (3.) 6 (.6), (.6) 73,7 (.9) Ø,6/, (./3.998 dia) 89, (7. ),7 (.) Key: 6, (.) Square x,3 (.88) long 9, (.37),/,87 (.989/.979),8 (.) 66, lternative drain port (.6) Inlet/outlet ports (see table):.6- UN- thread for SE O-ring fittings. View on rear end of pump Shaft rotation Inlet port RH LH Outlet port Ø,/, (.87/.87 dia) 7,8 (.88) Detail of shaft, key and locating diameter. 24 PV/6 and PV/ Manual/Mechanical Controls Lever Control - M and No Control - V Units with this control may be operated on both sides of center permitting bi-directional fluid flow characteristics. 3 R 9,7 (.38 rad) 76, (3.) 6, (.) Position Position Ø6, (. dia) 7 (.) Shaft rotation RH LH Lever position Handwheel Control - H Max. flow adjustment. djust and lock to limit max. flow.,7 (.6) Outlet port Units with this control may be operated on both sides of center permitting bi-directional fluid flow characteristics. Ø7,/7,7 (.68/.68 dia),7 (.6) No Control - V 37,3 (.7) Lever may be set at any position in 36 circle. Ensure clamp bolt is fully tightened. Position Ø7, (. dia) Ø6,3 (. 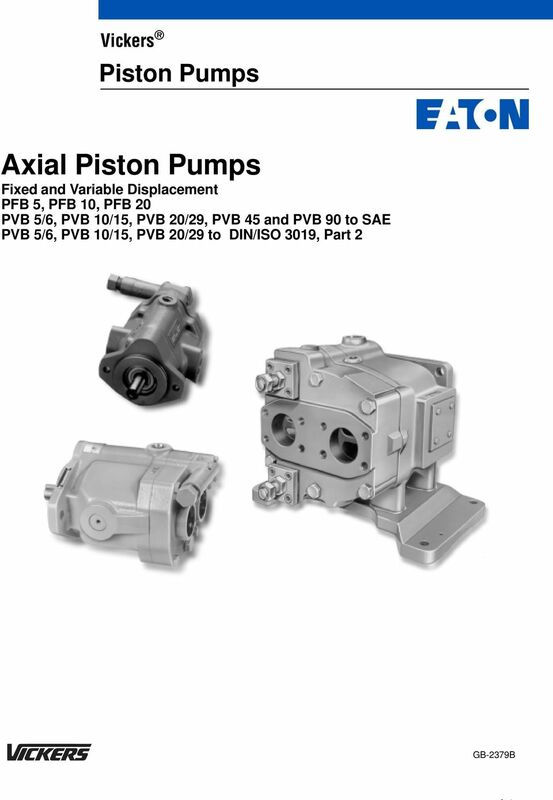 dia) Pump type PV/6 3 (6.) PV/ (8.) C R (.9 rad) 68,9 (.7) 99,9 (3.93) Caution! Loosen lock screw before turning handle. Re-tighten after adjusting flow. 6 (. ) max. 3,7 (.7 ) 6,7 (.6) Position 3,3 (.39) Shaft rotation RH LH Pointer position Handwheel rotation from zero Clockwise Counter-clockwise Clockwise Counter-clockwise Outlet port Pump type PV/6 (7.87) PV/ (9.8) 9 (.8) (.) C 7,6 (.78) 93, (3.68). 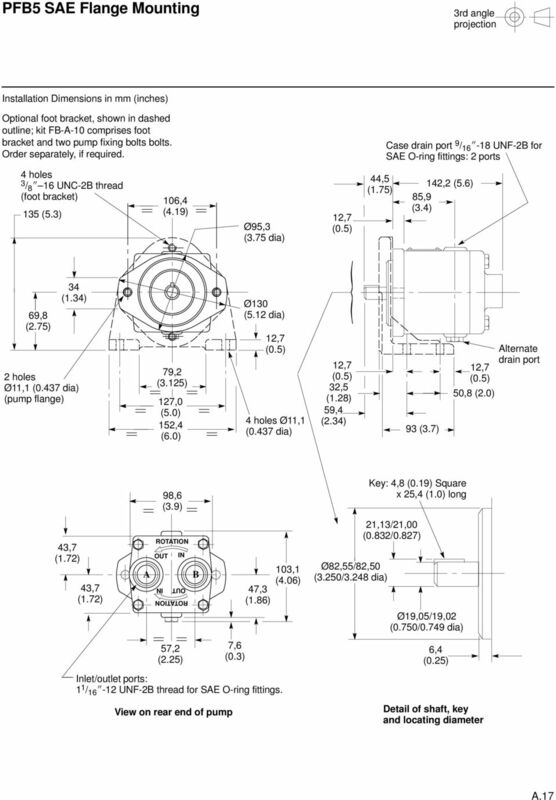 25 PV/9 SE Flange Mounting Pressure Compensator Control - C and CM Installation Dimensions in mm (inches) See also Control Data section, page.. holes Ø7, (.69 dia) holes Ø7, (.69 dia) R.H. Shaft Rotation 6, (8.9) 8, (7.) Optional foot bracket, shown in dashed outline; kit F-C- comprises foot bracket and two pump fixing bolts bolts. Order separately, if required. 8,9 (.3) Ø6, (.7 dia) Ø,8 (8.38 dia),9 (8.) 3,8 (.) 9, (.3),7 (.6) 8,8 (3.) Case drain port.7-6 UNF- for SE O-ring fittings: ports 3, (.86),7 (8.73) 9, (.6),7 (.6),8 (.) 3,9 (9.) 6, (. ),8 (.) 39,9 (.6) 9, (.7) 8, (.) 7,3 (.68) 76, (3.) Caution: While pump is operating do not back compensator adjustment screw out beyond dimension shown. 8, (.) 8,8 (3.3), (.6) Key: 7,9 (.3) Square x 3,7 (.) long 9, (.37) 66, (.6) 9, (3.7) 89, (7.) 9, (.3) Ø7,/6,9 (./.998 dia) 3,33/3,8 (.39/.38) 8, (3.) 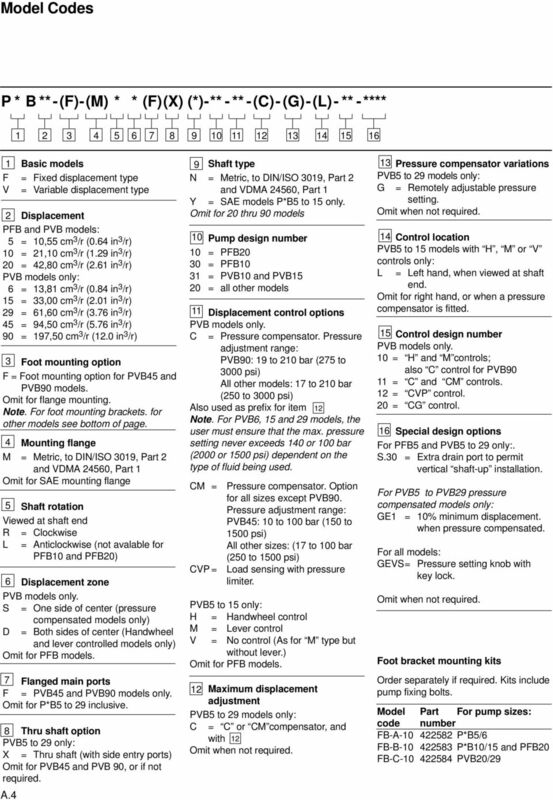 lternative drain port Inlet/outlet ports (see table):.6- UNF- thread for SE O-ring fittings. View on rear end of pump Shaft rotation Inlet port RH LH Outlet port Ø3,7/3,7 (./.8 dia) 7,7 (.88) Detail of shaft, key and locating diameter. Extremely compact in size to allow direct flange-mounting on vehicle engine or gearbox PTOs. HYDRAULIC MOTORS Concentric A Innovation in Hydraulics Introduction to Concentric Hydraulic Motor Capability Concentric offers one of the widest selections of gear pumps and hydraulic motors in the industry. USA Headquarters. Dynex/Rivett Inc. 770 Capitol Drive Pewaukee, WI 53072 U.S.A. Tel: 262-691-2222 FAX: 262-691-0312 E-mail: sales@dynexhydraulics.